By now you have probably heard about the extremely embarrassing LinkedIn password breach. If you have a LinkedIn account (or possibly, if you have ever had one), there is a good chance that your password, in a weakly encrypted format, is in the hands of a hacker in Russia. He published as proof a massive, 6-million password file that is now widely available on the internet. There’s even a service that guides you through the process of searching for your password in the file (link courtesy John Moltz). 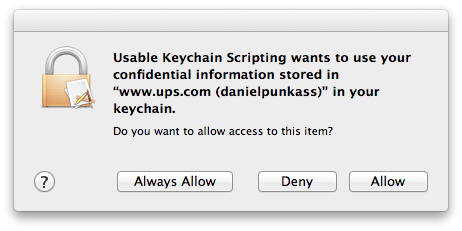 tell app "Usable Keychain Scripting"
The problem here is that permission to access keychain items is managed on a granular level. It’s possible to tell the security system to allow a particular app to always access a particular item, but you can’t tell it to always allow it to access the entire keychain. There are obvious security reasons for this, but I do think there should be way to enable this for folks like myself who really want to take control over my secure data and examine it programatically. Fortunately, I do not give up easily. I could have clicked that Allow button 2,000 times, but then I wouldn’t have had the time to write this blog post. Instead, I delved into another avenue of scripting that takes advantage of Mac OS X’s accessibility infrastructure. Using GUI Scripting commands, the clicking of specific buttons can be automated. In this case, I came up with a script that runs in a loop, waiting for there to be a security window with a button called “Allow” in it, and indiscriminately clicking it. Obviously, this is very dangerous! I’m going to run this script only during a precise window of time where I know that the only security dialogs coming up should be ones that are provoked by my Usable Keychain Scripting script. This trick worked. After 20 minutes or so of chugging through my keychain and automatically approving the accesses, the result came back. To my relief: the password was only used for LinkedIn. You can use this trick, too. Just be careful. As I said above, the idea of an automated script that blindly approves security warnings is not for the faint of heart. It should go without saying that if you screw anything up in your keychain, it is unequivocally not my fault. Do not use these tools if you don’t understand how they work. Usable Keychain Scripting is my scripting extension, that expands AppleScript’s ability to efficiently query the keychain for information. PasswordSearcher is an AppleScript that asks the keychain for all the internet password items that match the given password, and displays the account names so you know which ones to look for. DangerousAllowClicker is the bad boy that just runs in circles until you cancel it, approving security clearances. Click here to download the tools archive. Launch Usable Keychain Scripting, so it will be available to the scripts. You won’t see anything, it is a background-only app. Open Password Searcher, change the password string to match the one you want to search, and run it. You should immediately see one of those security approval dialogs appear. Don’t bother clicking it. Now open up DangerousAllowClicker and run it. You should see the security panel disappear, and successive panels disappear in turn. As I said, this technique is only suitable for the very technically adept, but I am glad to share it because I think some of you will find it useful for other purposes as well. You could theoretically use this trick to automate dumping your password information so as to import it into another management tool such as 1Password. A tool that, as it happens, does allow you to search all your items for a specific password. I can’t stress enough how void of a warranty, guarantee, support, or any liability these tools are. You shouldn’t use them, but I hope that reading about them has been interesting. Update: As luck would have it, mere moments after publishing this, I got word from the 1Password folks about another write-up that achieves something different (exporting for 1Password), but makes use of the very same approach of automating the clicking of that allow button. This entry was posted to Hacking, Technology. Both comments and pings are currently closed. Thanks for reading! How does Google Chrome access the keychain without confirmation dialogs? Is there yet another mechanism? kosh: If the items are ones that Google Chrome itself put in the Keychain (likely for the majority of things Google Chrome is liable to access), then there is no demand to ask for permission again. If Google Chrome wants to access a keychain item’s contents that it did not put in the Keychain, or which has not previously been authorized as “Always Allow”, then the alert will appear. After 4 hours these scripts were still going through my keychain. Yes I have years and years of stuff in there. I gave up and had to force reboot. Hi Greg – I have heard reports like this from a few people. Maybe there is some issue with certain keychains that makes the scripts get stuck. I wonder if it’s worth trying the alternative “dump” script that I linked to at the bottom of the post, to see if it has luck dumping out the contents of your keychain where you could then search the dump file manually. I let the script run overnight and it was still running after 8 hours. I think it was endlessly looping through the keychain over and over. I will try the other script you linked too. hello!,I really like your writing very a lot! percentage we be in contact extra approximately your post on AOL? I require an expert in this area to solve my problem. Maybe that’s you! Having a look forward to look you. I used to be suggested this web site via my cousin. I am now not certain whether or not this put up is written via him as nobody else recognise such distinct approximately my trouble. You are incredible! Thanks! it might just be me, but I find it highly disconcerting that you can use the accessibility stuff to automate access to security-related checkboxes. What stops a malicious app asking for keychain access and automatically clicking the button itself? Tom: I think it’s a totally reasonable concern. This is probably one of the reasons that accessibility features are disabled by default in Mac OS X.